You can now buy TShirts with the revenge logo on it. Powder blue on navy short sleeved shirt. More reviews have been added, including great ones from New Gandy Dancer & Reverb Central. Check them out here. Sunday 11th November, the Mona Vale Hotel is hosting a benefit for Wayne Goodwin, violinist/composer and multi-instrumentalist. More info here . Visit the new surf music website. You can securely buy Revenge of the Surf Guitar, as well as other Australian surf music. Visit the site at www.bombora.net.au. Watch a short interview from the Delightful Rain documentary. Reviews are starting to come in from all over the world and they’re all raving about the album. Check them out here . Go along to ROTSG’s MySpace page to check out some of the tunes from the album. You can also buy the CD from the page through PayPal. 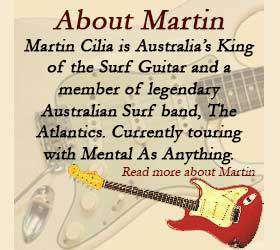 Martin’s solo CD “Revenge of the Surf Guitar ” was released this week. You can read more about it here . You’re invited to visit Martin’s new MySpace page at www.myspace.com/martincilia and become a friend. You can also hear a few songs, watch some videos and stay up to date with latest gigs. You can also visit the new Atlantics MySpace page . Watch The Atlantics “Point Zero” film clip that was featured on Rage on ABC TV recently. Watch a different version of Reef Break from Australian TV. Bluelounge have released their new CD and an updated website to go with it. All the songs were written by Martin. Visit the website at www.bluelounge.com.au. You can buy the CD from the site. Read reviews at Reverb Central & in the 2 Good 4 Words newsletter (PDF file 1.11MB). Martin became one of only 4 Australian songwriters to win a “Just Plain Folks” songwriting award in 2006. The award was for the Best Surf Song for “Point Zero”. You can listen to Point Zero on the music player (at the top right of the page). Read more at the website. Watch “Where are they now?” on Sunday, February the 11th at 6.30pm to see The Atlantics play Bombora. The new season of Bondi Rescue will be featuring music by The Atlantics (written by Martin). The first episode, airing Monday February the 5th at 8pm, uses “Reef Break”. Martin is playing in the Bon Scott Celebration Concert with Dave Warner on Sunday the 25th of February 2007. Read the press release here. The Atlantics played in Noosa on March the 9th, along with Tamum Shud and Beau Young. PDF file 62.7KB) from InPress magazine 15th November 2006. Visit their MySpace page for more info.